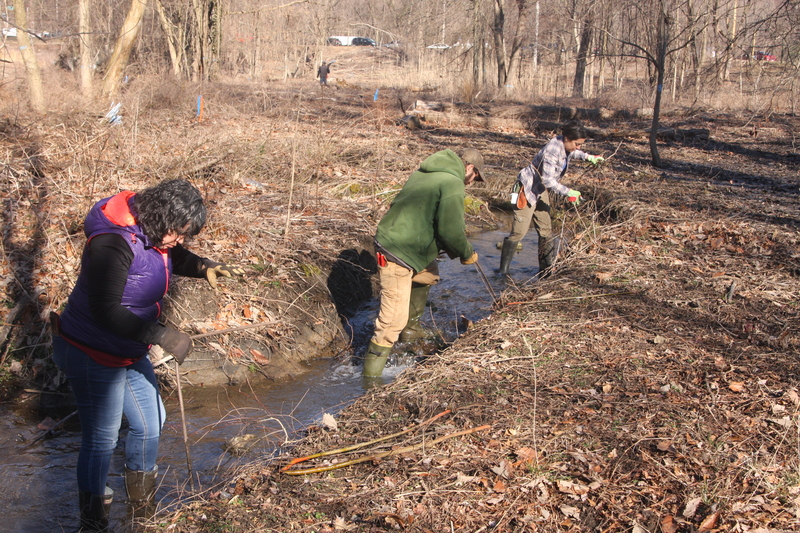 About 1,000 live stakes were planted into the stream banks on the grounds of the Fairmount Park Horticulture Center, as part of an ongoing restoration project in the Lansdowne and Montgomery creek valleys. 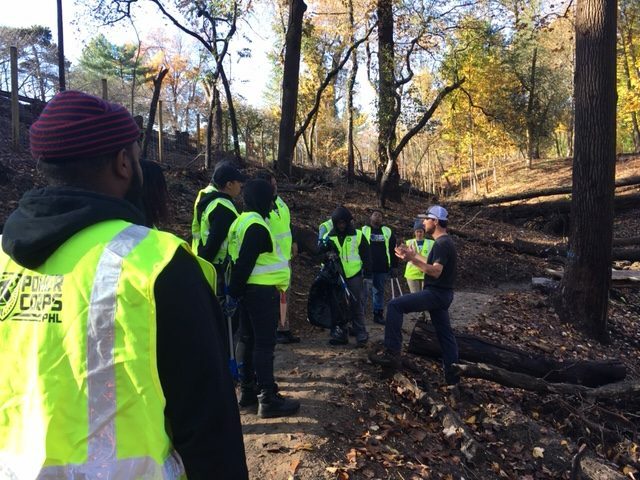 Staff from Fairmount Park Conservancy and Philadelphia Parks & Recreation spent a recent morning installing live stakes, or tree stem cuttings, along the stream banks of the Lansdowne and Montgomery creeks, which meander along the Horticulture Center’s grounds and make their way to the Schuylkill River. 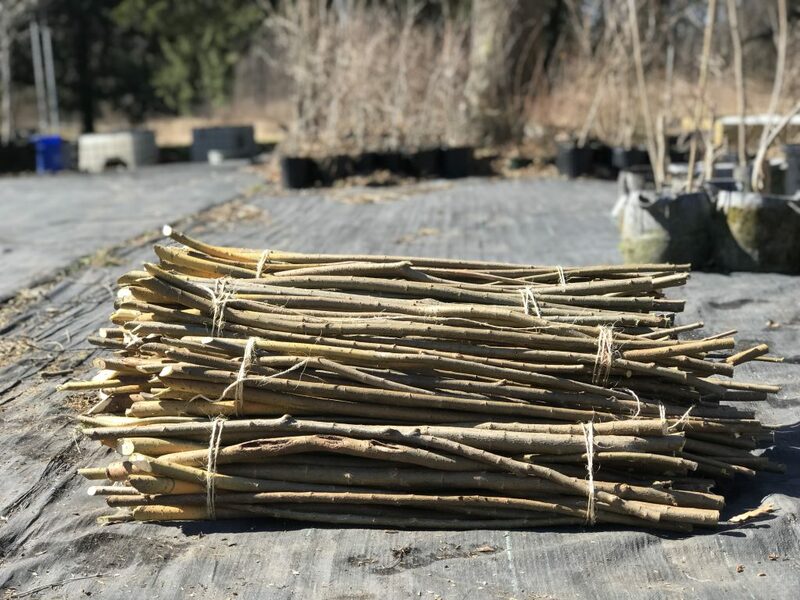 The live stakes were originally harvested from a variety of willows and dogwood, just a few miles away at Greenland Nursery in late February. Willows and dogwood are ideal for live staking because they grow readily along stream banks and have the ability to develop roots from the cut stem. Once the live stakes grow roots, they will grow into trees and shrubs and help fortify the stream banks and prevent soil erosion. 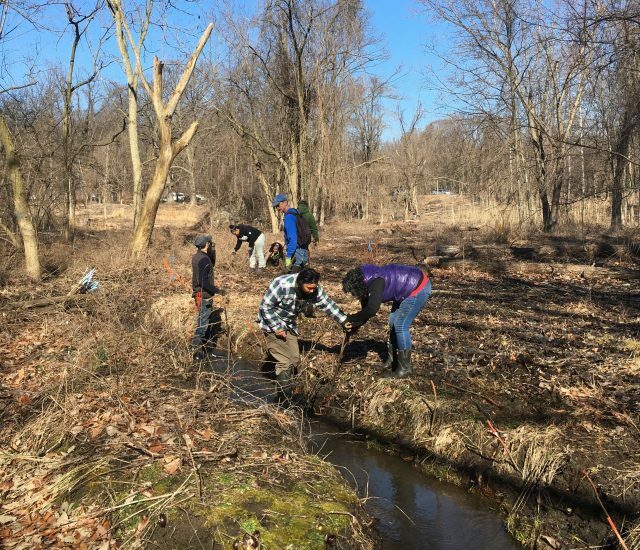 In addition, these species will provide much more benefit to insects, birds, and mammals than the invasive plants that were removed from the grounds last year. For example, they are an excellent source of pollen and nectar for native bees and provide exceptional habitat for birds that eat dogwood berries or nest in willow trees. 1. 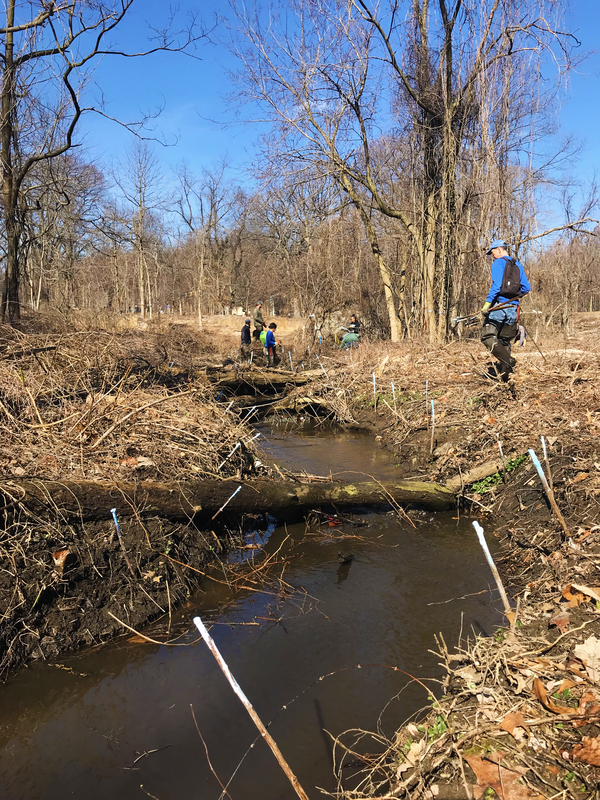 First, we planned out the planting sites along the stream beds, deciding what type of live stakes should be planted in certain sections. 2. Next, we began planting the live stakes, placing them approximately three feet apart. 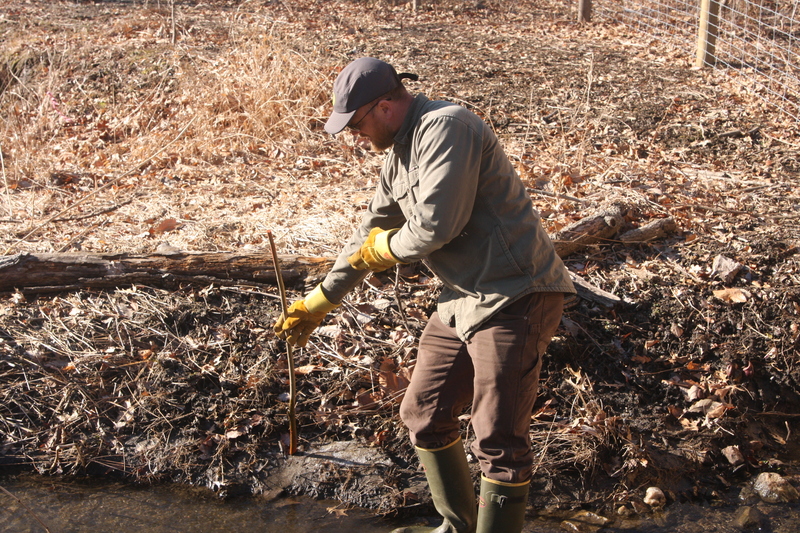 Live stakes should be planted close enough to the water so that they have constant contact with moisture and at an angle facing downstream. Make sure about half to two-thirds of the live stakes are in the soil. Tip: It helps to have a piece of rebar to create holes for the stakes first. 3. In total, we planted about 1,000 live stakes on the grounds and will now wait for them to take root. 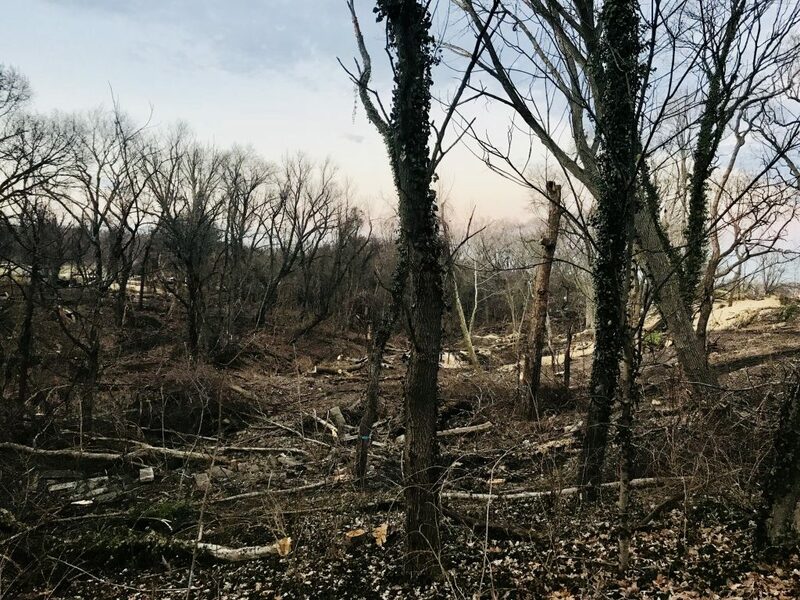 Stay in the loop about the latest updates with this project and others by subscribing to our Fairmount Park Conservancy newsletter here. What’s going on at the Fairmount Park Horticulture Center?